Alice never dreamed of a world like this. The numbers tell one part of the story. Some 80 percent of the world’s people have gained mobile access in less than two decades. Smartphones already account for almost 40 percent of global mobile-phone sales, and they are increasing fast. This year, mobile access will overtake fixed-line access as the world’s primary way of going online; four out of five broadband connections will be mobile by 2015. For a large and growing share of users around the world, the Internet will be an entirely mobile experience. This isn’t your father’s Internet, however—or even your older brother’s or sister’s. The mobile experience is a whole new universe of connectivity that’s local (it’s always where you are), personal (tailored to your needs and preferences), social (all your friends are there as well)—and it’s always on. That four- (or seven- or ten-) inch screen is much more than a digital image: it’s a real-life window into an entire world that’s open 24/7/365, just waiting for its owner to climb through. Continuous access to information, communication, friends, and entertainment—among myriad other things—turns out to be as addictive as any opiate. Just like Alice peering into the world beyond the looking glass, everyone wants to check it out—continually. Numerous factors are converging to give mobile the capabilities, scale, and reach achieved by few other technological advances. These include devices with computing power and memory that come close to rivaling desktop PCs; increasingly ubiquitous network coverage characterized by high-speed data connections and low network latency; ever-improving battery technology; the ability to apply “context”—location and social networks—to generate value; the proliferation of sensors in devices—for example, multiple cameras, GPS, and motion and temperature sensors; and all manner of wireless connectivity, including Wi-Fi, LTE, Bluetooth, and near field communications. That’s not to mention smartphone and tablet functionality akin to that of a Swiss army knife, and vibrant application-development ecosystems with large and growing user bases. In addition, “machine to machine” communications, including smart metering applications, the connected car, and the connected digital home, are being aggressively pursued by many of the world’s leading companies. Combine these factors with two demographic realities, and the full scope of mobile’s impact begins to emerge. One demographic shift is the advent of a big new generation of consumers into the economies of the developed world: the 16- to 34-year-old Millennials, who outnumber the baby boomers and have a far greater degree of technical sophistication, appetite for consumption, and desire to be connected. Their primary experience with the Internet is mobile. The other demographic fact is that the vast majority of the world’s population lives in developing markets where the Internet is just taking hold and where the Internet experience is mostly mobile. As the next billion consumers come online, it will be through the screen of an Internet-enabled smartphone or feature phone. Internet economy in the G-20 nations. Japan got the mobile-media ball rolling with the first camera phone and mobile novel more than a decade ago. Streaming video followed soon after. Mobile devices are natural enablers of media consumption, and consumption has exploded since the introduction of the smartphone, starting with music, games, and user-generated content, and now extending across virtually all media categories. Users derive enormous value from user-generated content and social media, which are available only online, of course, and increasingly accessed through mobile devices. Nearly two-thirds of Facebook’s one billion members regularly use Facebook on their mobile phones, and more than 60 percent of Twitter users are tracking tweets (as well as tweeting) on mobile devices. ComScore reports that the average number of Instagram’s daily mobile visitors jumped from 886,000 to 7.3 million between March and August 2012. There are more than 300 million microbloggers in China. Games have become an online phenomenon—and not just for youngsters. In the U.S. alone, there are 100 million mobile gamers (almost a third of the population), and people spend almost eight hours a month on average playing games on their mobile phones. As the CEO of King.com, the company behind the current top game on Facebook—Candy Crush Saga—told Forbes.com, “As smartphones get better and more consumers are opting to use their mobiles and tablets to access games, their expectation is access anywhere.” A 2012 survey by game developer PopCap found that 44 percent of adults in the U.S. and the U.K. played at least one mobile game in the previous month—an increase of 29 percent over 2011. Smartphones are the third-most-popular device for listening to music. Sales of recorded music increased in 2012 for the first time since 1999, driven largely by downloads, which comprise some 70 percent of revenues. Approximately half the readers of the New York Times, the Wall Street Journal, and USA Today read these newspapers online or on a mobile device, according to the Pew Research Center. Other media categories are experiencing the mobile migration as well—and not always to the detriment of incumbent players. Amazon reports that eBooks are now a billion-dollar category worldwide for the company. In the U.S., Nielsen reports that mobile-connected moviegoers spend more, consume more content, and are more actively engaged in the moviegoing process. Tablet-owning moviegoers spend 35 percent more on entertainment monthly than the average U.S. consumer. We argued recently that, despite manifest disruption, the media industry seems primed to enter another golden age. 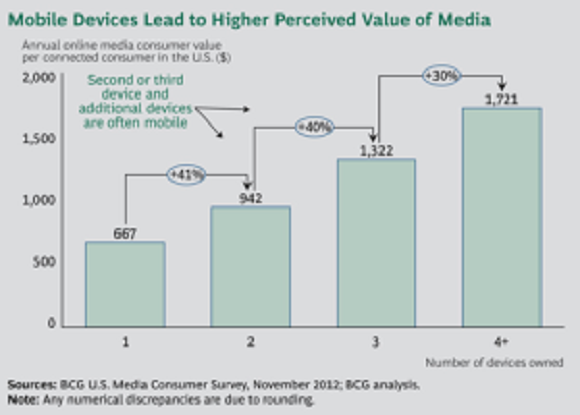 (See Follow the Surplus: How U.S. Consumers Value Online Media, BCG Focus, February 2013.) This one, like its predecessors, is being led by new technology and new possibilities that consumers enthusiastically embrace. Mobile is already a driving force behind this transition. As Alice discovered when she stepped through the looking glass, the world behind the digital screen is different. Most companies do not yet have all the capabilities they need to engage customers and employees. The first step is to assess their readiness by putting their businesses through a mobile health check, including a view of their ability to compete in the diverse mobile ecosystems taking root in different economies. Success will likely follow a very different path in Japan or China than in the United States. It almost certainly will in India or Africa. This report explores mobile development in multiple regions and economic sectors. We argue that while none of us can say with specificity where mobile is going, the aggregate effect—technological, social, and economic—is such that companies and governments have no option but to embrace it. We offer some thoughts on how to go about doing so.